The good news just keeps on coming for Cincinnati’s neighborhoods. 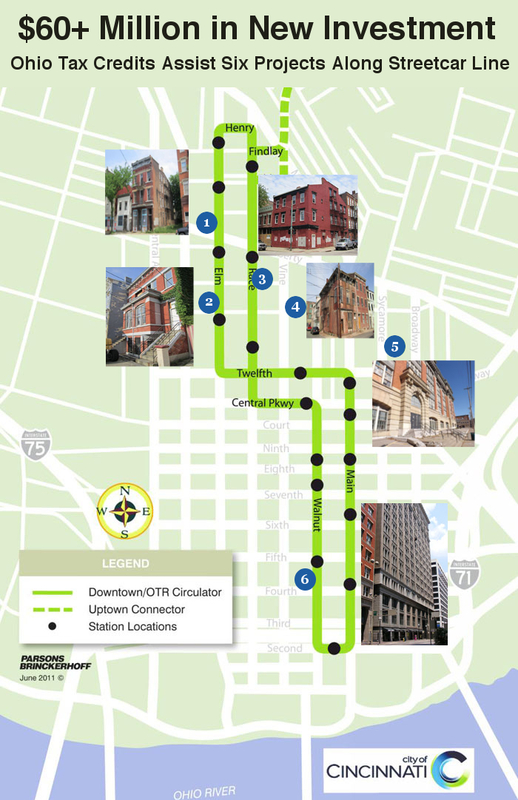 The state has just announced that roughly $9.1 million worth of Ohio Historic Preservation Tax Credits will flow to six projects along the phase one route of the Cincinnati Streetcar. The awards are part of a biennial distribution of historic tax credits state-wide. In this round, the state credits will spur approximately $61 million in private investment throughout the Central Business District, Pendleton, and Over-the-Rhine. Brill House ($256,250 total project cost; $62,500 historic tax credit): Located at 1612 Elm Street, just south of Findlay Market, the Brill House is a “slender three-story apartment building adorned with balconies, wrought-iron detailing and a bracketed cornice.” Porch Swing Properties acquired the property and plans to renovate the structure into seven residential units with a street-level storefront. 1405-07 Elm Street ($1,838,474 total project cost; $247,981 historic tax credit): Located just north of the newly renovated and expanded Washington Park, these properties are slated to be renovated into four market-rate apartments. 1500 Race ($1,043,319 total project cost; $221,379 historic tax credit): Located at the corner of 15th/Race, the 118-year-old structure is planned to be rehabilitated into three market-rate apartments, two vacation rental residential units, and commercial space on the first floor. 1667 Hamer ($215,000 total project cost; $52,200 historic tax credit): This property is also located in Over-the-Rhine and was purchased through the OTR ADOPT program. The new owners intend to immediately stabilize the 143-year-old building, which has been vacant for more than a decade, and rehabilitate the structure into three one-bedroom, market-rate apartments. Woodward High School ($24,292,232 total project cost; $3,471,904 historic tax credit): This property is better known as the former SCPA, but its original construction 103 years ago was to serve as Woodward High School. Located in Pendleton, the new owners and developers intend to transform the property into a boutique hotel with residential apartments. The previous proposal called for renovating the entire structure into 155 apartments, but that proposal has since changed as a Marriott has expressed interest in opening an AC Hotel at the site. The project requested $5 million, and is still eligible to receive the remainder of that tax credit in future allocations. Union Trust Building ($33,250,000 total project cost; $5,000,000 historic tax credit): Located at 4th/Walnut in the Central Business District, this 17-story tower is famous for its design by architectDaniel Burnham. Originally built for Union Trust Bank, the predecessor to Fifth Third Bank, the office building has sat vacant for several years following its foreclosure. New owners have signed an agreement to renovate the tower and open a 300-room Renaissance Hotel by Marriott.